eben nicht, welches "Groß" denn ? Scharnhorsts und Gneisenaus(=Bismarck) Geschütze hatten auch historisch eine geringere Ladezeit als die meisten anderen BBs Die restlichen T7 BBs haben eine ebenfalls recht akkurate Ladezeit von ca 2 rpm, nur Nelson wurde auch gebufft von 1.5 auf 2 rpm, sonst wäre sie nicht spielbar gewesen dass man aber bei der KGV von 2 auf 2.4 bufft wo das Schiff doch ohnehin schon gut genug ist, war schlichtweg unnötig und ist der Grund, weshalb KGV leicht überperformt. das hatten 10 HE-Gimmik Kanonen schlichtweg nicht nötig... deshalb bin ich froh, dass man DoY wieder mehr an ihr historisches Vorbild angelehnt hat, und das Ergebnis ist ein deutlich ausgeglicheneres Schiff! does anyone know why Richelieu's stock-hull looks so strange ? Straßbourg-command tower, 5x3 secs, catapults ? is this another fantasy-garbage thing, no one demanded for ? so hard to use early-war Richi as stock and late war Richi as B-hull ? I'm not a fan of "permanently buffing RoFs" ingame, more "pew-pew" here, more "pew pew" there. no thanks in case of Hipper/Eugen, I would give them 1 heal consumable. german ships are more based on good survivability than on good damage output. the heal consumable would bring Hipper/Eugen closer to this, than more "pew-pew"
WGN present's Michael Bay's World of BOOOOMships special super-cool features: - now, every "kill" will look like a gigantic magazine explosion -> boooooooooom - sunken after 2 min of torpedo flooding ? -> booooooooooooooooooooom - sunken by a little secondary gun ? -> booooomooooooooooooom - sunken by a fish, touching you? - booooooooooooooooom roadmap: - implementation of a "nuclear explosion" animation, if your magazine really explodes! -> super cool booooooooooooom XXL WGN! we do everything to please the 14 years old kiddis within our (mostly adult) playerbase! Brits: Special case across the board? every "kill" looks like a massive "magazine explosion", blowing up the ship completely. thats too much I like the new water splashes and the fire animation, but the kill-explosions are overdone ! 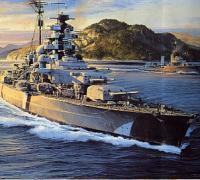 RN BBs are pretty well balanced, I swear they are so good, that no other ships will be played soon after release and when 24 ships in a match are overpowered in the same way, its balanced again ! thats magic !